Mavin Records boss, Don Jazzy and technology company Tsaboin has collaborated and launched Flobyt, a free WiFi service for Nigerians living in Lagos. According to Dele Odufuye, Tsaboin MD/CEO, disclosed that the WiFi service can be accessed in locations like eateries, parks, taxis, buses, restaurants, and cafés. and we hope many like him well do it in d/f states. 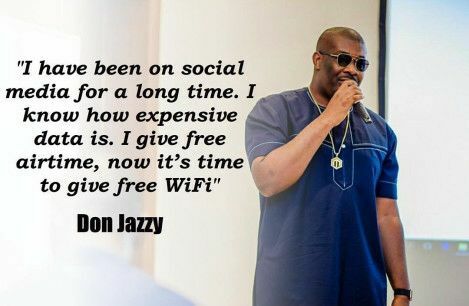 Don Jazzy weldon,this what we want to hear,but its bad that you didn't lunch it in my house. This is a welcomed development and we say THANK YOU FOR YOUR KIND WORK.